FromTheFarm.com is America's online farmers market offering customers farm fresh fruits and vegetables, meats, flowers, fish, gift baskets, and more - all shipped direct to customers from the farmer who grew the product. Nothing is warehoused and everything is backed by a 100% satisfaction guarantee for flavorful, fresh, great tasting products. Customers can learn who grows and packs the food they order, cutting out the middle-man of shopping in grocery stores. Remember to visit 58coupons for best deals on From The Farm products with From The Farm coupons, From The Farm discounts and From The Farm savings. 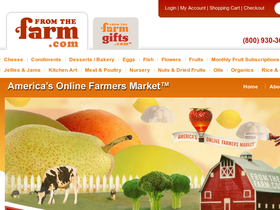 Head on over to From The Farm and sign up for their newsletter to receive 10% off your order. Visit FromTheFarm.com today and checkout their weekly specials where you can save with big discounts and enjoy the best seasonal products. Buy 2 beautiful and exotic potted orchids for only $49.95 from FromTheFarm.com. Click link and start shopping. Give a tasty gift of beautifully arranged dried fruits and nuts gift baskets from FromTheFarm.com stating at only $21.95. Click link to see the great selection.